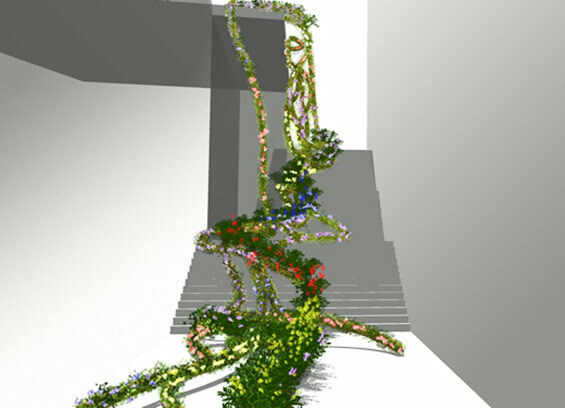 Project for the international competition of ephemeral garden. LAUSANNE JARDINS 2014 (also known as LANDING), which is held every four years since 1997 in the city of Lausanne (Switzerland). It is considered in the avant-garde of its kind, by their proposals and unusual locations. Our proposal, obtained a distinction and the subsequent development and building in on one of the sites allocated for the Organization, for the spring-summer of next year (2014). Our desire to return to the Green, lush and even exotic world, in opposition to the architectural drawing and his ‘tyranny’ of the plane, graphic presentation, it was expressed in the design and construction of this garden. We want to transmit that feeling in a closer way to citizens, recreating areas of greenery: a terrace, a balcony, a pot… anything goes! 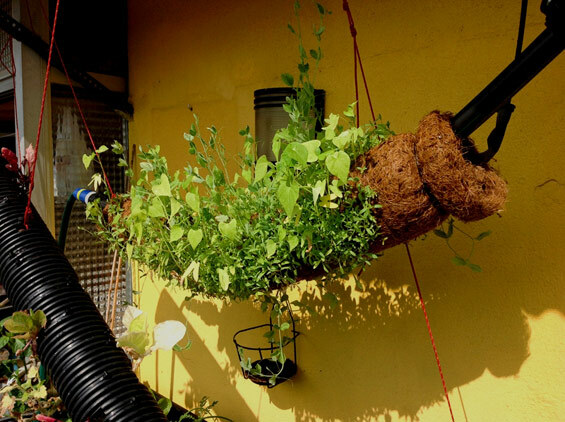 The requirement of the contest to assemble a multidisciplinary team with a professional root in gardening, it offered us the opportunity, to run unusual proposals in urban conditions, in some cases quite extreme. The creation of this ephemeral and unconventional garden was carried out in a way that all members of the team contributed and were free to modify or develop the idea according to the project requirements. We want to change the perception of greenery in the citizen, using as support, the garden architecture, hence we apply a process of design, where the domain of plant material prevails over technique and aesthetics, research, creativity and technical expertise. Intention is to call into question, the predominance of the visual design in the process of design and to demonstrate, that can be replaced by a balanced led design process, participation and opportunity to add more details to the finished work of simple drawings and presentations. This concept is rooted in the notion of designing something that cannot be drawn, which is pure process. 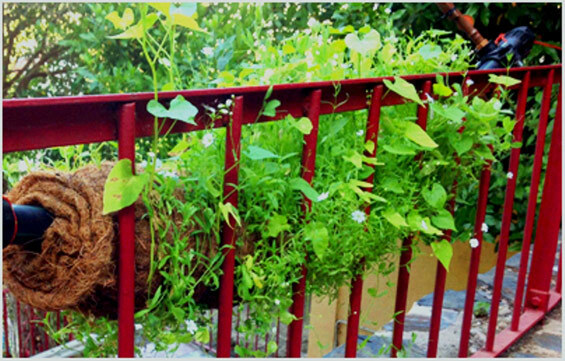 The garden follows the citizens around the city, popping up in unexpected places. It was conceived for an informal installation, built of various materials, some recycled, some reclaimed. Climbing plants and herbaceous may be seeded, or found in the vicinity, in the streets and nearby gardens, and stolen to be planted in the rolling garden. This is formed by a loose frame of plastic pipe, an infill of light substrate and covered by the coconut fiber roll used in bio-engineering. 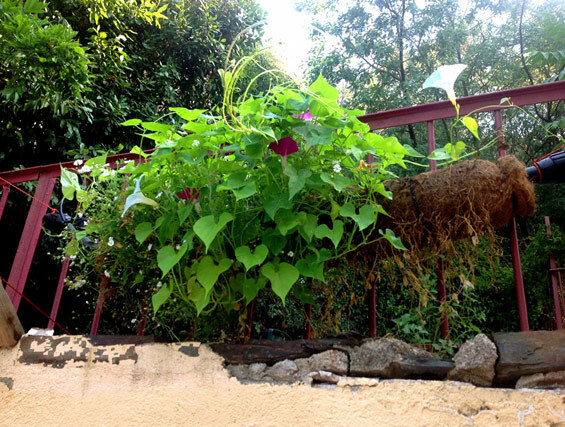 This structure is sown with different seeds and planted with seedlings that will eventually grow into maturity. Each roll is different from the others and they may be easily transported and placed in a different way. They are not heavy therefore they can be used in roof and wall gardens. 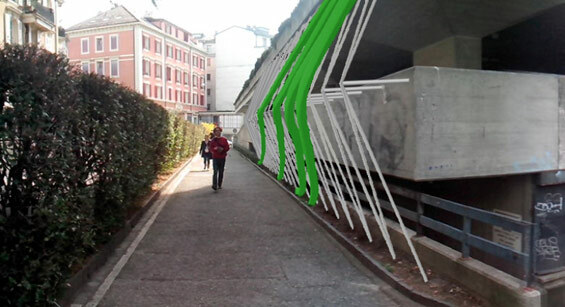 Half green wall, half refuse tip, with no definite shape, just loose intentions, The Rolling Garden objective is to remind the tidy citizens of Lausanne that green exists in the most ’untidy’ forms. 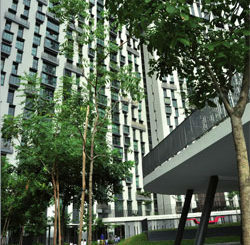 1 – ADAPTING “ROLLING GARDEN” FOR A DIFFERENT SITE THAN THE INITIALLY PROPOSED (SITE #16). Other colleagues were incorporated in this new phase of the project (see document team work), in this exercise of laboratory, as a contribution to be considered in landscape design. 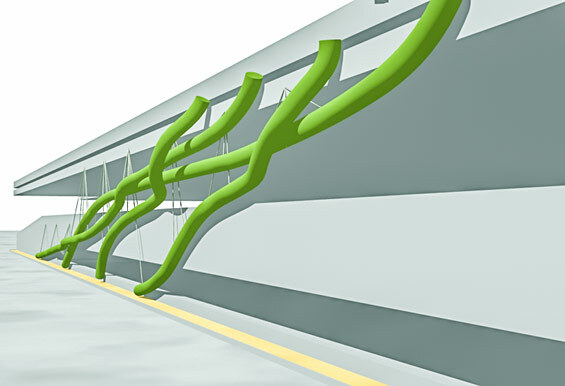 The result of our multidisciplinary collaboration, has been a technically sophisticated solution, called “Rolling Garden”, a network of country tubes that float in the air and creep different surfaces, like the branches of a tree in a forest and paying homage to them in a humble way. We have taken the advantage of “freedom” and the “ever-evolving design process”, to adapt the original idea to the characteristics and requirements of the new location assigned from Lausanne Gardens organizing committee. Due to the features of the new site, the “Rolling Garden project” proposal was adapted to the conditions and features of the new site. Work on the vertical plane that forms the façade of the building. Free movement of wheeled and pedestrian, at the foot of the facade of the building. Findings, tests and trials with the prototypes of the “rolling stones”, and budget restraints for the implementation of the proposal. Simplification of the pipes (‘Rollings’) layout; the structure extends in a more or less linear manner with moderate slopes and relatively consistent. These elements ease proper functioning of substrate, vegetation and irrigation system. Simple and lightweight structure that does not interfere with the ‘Rollings’ on an aesthetic level. 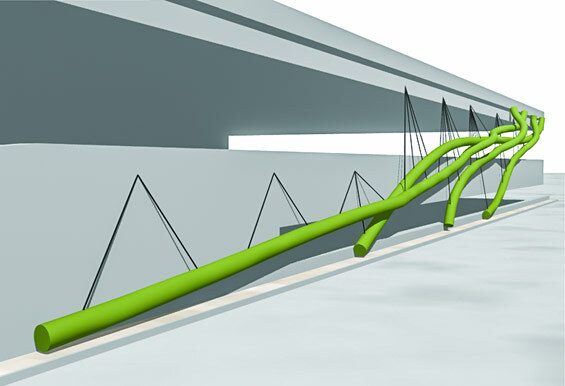 This has been solved in a cheap way and supports the expected loads, with braided steel cables. …We kindly invite you to visit our Rolling Garden, in Lausanne Gardens 2014. Eduardo Casado Fernández, M. Sc. In Agriculture Engineering, M.A. In Landscape Architecture, Postgraduate In Arboriculture And Urban Tree Management, Postgraduate In Environmental Restoration.